No unauthorized commercial use may be made of this material. The orginal deed was from John M. Hakes and wife, Maud. The cemetery was than sponsored by the W.R.C. (Womens Relief Corp) Cemetery Association, and later taken over by the City of Ainsworth. Baldwin, Glenn A. 08-06-1900 09-08-1983 ? ? ? ? Bartlett, Victor F.(hus of Helen De Vall m. 11-14-1959)(son of Fritz & Ida Gordon Bartlett) 11-03-1939 01-15-2007 Riverview, Ne ? ? ? Bowen, Infant ? ? ? ? ? ? Bowen, Bess Corbitt(wife of C.T.) 07-27-1883 02-15-1944 Rosecreek, Minn ? ? ? Brewer, Mrs. no dates ?? ?? 11 10 ? Brewer, Owen(husband of May Ezella)(son Of Thomas & Mary) 11-09-1874 07-04-1954 Stockwell, IND 11 10 ? Coleman, Margaret Vivian Marshall(Wife of Glen m 10-31-1945) 03-06-1924 04-22-1982 Johnstown, NE ? ? ? Corey, Warren H. (Civil War) 08-11-1849 08-13-1914 ? ? ? ? Cornett, Edith Marie Haun(wife of Paul) 12-28-1908 08-24-1992 Nordon, NE ? ? ? Denny,Terry(son of Gladys&Vern) 10-27-1935 02-11-1999 ? ? ? ? Denny, Vernon (infant son of Vern &Gladys) 09-02-1930 ? 11 38 ? Duden, Jess Allan(son of Larry & Elaine)(Navy) 03-31-1982 09-18-2000 Ainsworth, NE ? ? ? Gregory, Louise Limbachar(wife of James F.) 01-16-1848 04-20-1942 Wappelo, Iowa ? ? ? Ingalls,Faye M. 1914 1999 ? ? ? ? Jackson, J.M. (Civil War) No dates ? ? ? ? ? Magill, Elizabeth no dates ? ? 12 35 ? Morgan, Fred N. ? ? ? 11 36 ? McAndrew, Gail 02-16-1898 12-20-1977 ? ? ? ? McGrew, Infant ? 1897 ? 2 26 ? O'Conner, Martin ? ? ? 2 30 ? O'Conner, Thomas H. ? 1895 ? 2 30 ? Osborne, George	(husband of Nannie)	 ? ? ? ? ? ? Smith, Gerald Dean(hus of Velda Vee Lewis m.02-11-1956)(son of Earl L. & Lois E. Barrington Smith) 06-06-1938 06-10-2005 Ainsworth, NE ? ? ? Smith, May (No Dates) ? ? ? ? Swim, Edith M. 1908 1992 ? ? ? ? Wiswell, Selina Hammett(wife of Charles) 09-02-1830 07-29-1917 Nova Scotia ? ? ? 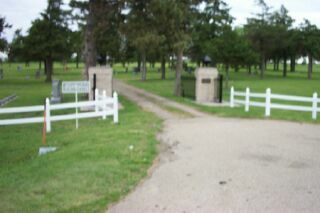 This cemetery was walked by Edward &Doris Torguson, summer of 1999. The information was taken from the tombstones. We apologize for any errors in reading or transcribing of information.